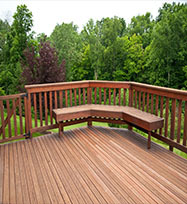 Decking is a great option for creating living and entertaining space outside. Despite the changeable weather it is becoming increasingly popular in the UK and our range of decking and tanalised timber is a great place to start when it comes to hard wearing and resilient materials. For big or small decking areas or using the material creatively for planters and flower beds we have a full range of timber and accessories at Formby Timber. We supply decking to Liverpool, Ormskirk & Southport.